What are Jack and Punzie up to now? Like most of the creative arts, people don't get into writing books in order to make money (not if they're smart anyway). We write novels because we have characters and stories and words pressing us to do so. Most writers I know think of any income they make as a way to support their writing habit rather than as a career, because of course, the hourly wage would usually work out to be pretty pathetic. So a huge, HUGE reward for writers is to hear back from readers and see that our works have been read and impacted someone and made someone fall in love with reading or pass through a tough period or love and/or understand themselves or others better or any of the magical things books do. "Rapunzel's Revenge and Calamity Jack brought our Christmas present opening to a 10 minute full-stop. The girls were so engrossed they hardly acknowledged our presence. It took a lot of coaxing to get them to continue opening gifts! Thanks for helping feed my girls' love of reading with your excellent books!! Merry Christmas!" 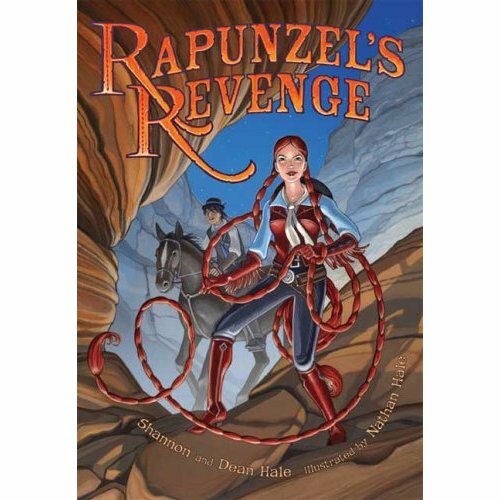 Rapunzel's Revenge book trailer contest: Vote now! Here are the awesome entries in our rapunzel's revenge book trailer contest! Please watch all the entries before voting at the end of this post. Voting ends February 25. Thanks to all for taking such time and care to produce these beautiful trailers. "I felt like Forest Born left the door open for more books. Will there be another Bayern book?" Not at the moment. I won't make the mistake of ever assuming I'm done with those books for good. But I don't think of them as a series necessarily. They are four books with interrelated characters. If another story seizes me in its clutches, then I'll write it. But forest born was one of the hardest books I've ever written, and I don't feel capable of diving back into that world right now. Besides, I really like how forest born feels there, book-ending goose girl. I'm at peace with the books and very involved in a couple other projects right now. But maybe someday! It makes me happy that people want to go back to Bayern again. "Can we enter the rapunzel's revenge book trailer contest more than once?" For those who haven''t seen the contest info, check out this blog post. Many of you have seen or glimpsed the awesome cover for rapunzel's revenge (in stores August) but here it is in all its glory! It's on Amazon now, which always makes a book feel more real. It's always a kick to see the ranking of a book, and among Rapunzel-themed books, we're #4! Ha-HA! For awhile there, I'm told, Strawberry Shortcake Rapunzel was beating us out, but no more! Take that, Shorty! You think you're so cool with your strawberry-scented hair and coven of friends who taste like desserts? Don't act so cute--you promote CANNIBALISM and it's time the world knew your true nefarious purpose. How are you gonna take over the world now that we bumped you out of number 4, huh? I'd like to know. Let me just prepare you for three months of build up for the release, because I don't know that I've ever been so excited about a book as I am for this one. I usually feel uncomfortable promoting my own works. But maybe because Dean co-wrote it and Nate illustrated, so it's not all me, I feel no shame at all. That's right, prepare for Shameless Shannon and her army of Flying Monkey Publicists. Also, sorry what I said about Strawberry Shortcake. That was uncalled for. I'm sure she's a very nice little girl who had a difficult childhood and can't help her desire to consume sweet, sweet human flesh. Thank for the bolstering, guys. This book really is a tough one. I sure chose a tricky story to tell, clever me. I don't mean to whine, but as I'm using this blog to in part describe the writer's experience, I want to make sure I'm being honest and describe the low times as well as the high. Some people have asked me why it's so hard to get established as a new writer or to get your book out there. I thought this might be interesting to you, to put in perspective. Here is a photo of our graphic novel rapunzel's revenge on display in a booth at Comicon in NYC last month. Our beautiful baby! Out in the world for all to see! Here is a photo of the booth where it was being displayed, along with dozens of other books from this publishing house (including American Born Chinese, which was awesome). We were very lucky to be here at all. And here is a map of the exhibitor's hall for the con. If you can even see it on this map, look for one of the tiniest squares--that was our booth. Now imagine the dozens and sometimes hundreds of other graphic novels, comic books, and novels on display in all those other booths. Those don't even come close to representing all the books out there, just the ones being shown at the con. You begin to get an idea of how tiny one book can be in the marketplace, how hard it is to make a noise. This is a tough business. Be under no illusions as you go forth, intrepid writers. It's tough to write a book, it's tough to publish a book, then it's tough to sell it. Which is why those things cannot matter to us, or we'll go crazy. It all comes back to the story. Just tell the story.